When I was fooling with my radio I learned the blue wires are power wires. There was one coming from the fan speed knob someone had put an inline fuse on. It was a newer blade type fuse so I'm guessing the blower motor was melting the original wire? Maybe if one was clogged with leaves and wouldn't spin it burnt the wire so they put that fuse in? That wire in your pic could power the cigarette lighter? Does it work? No problems with anything electrical on my z except the fan motor. It was working earlier this year. I will figure out the fan motor, I was cleaning up my wiring which is pretty much unmolested when unwrapping this section I found this wire not connected to anything. Maybe someone has their heater harness apart and can confirm it is a spare wire that goes nowhere. 72 z. 9-71 production date. when unwrapping this section I found this wire not connected to anything. Maybe someone has their heater harness apart and can confirm it is a spare wire that goes nowhere. 72 z. 9-71 production date. Is there supposed to be a picture attached? This is a correct harness, I have a number of them. They range for an early 1970 to 1973 model years. The blue wire is taped off on this one. I can pull out some more if you need to see some others. 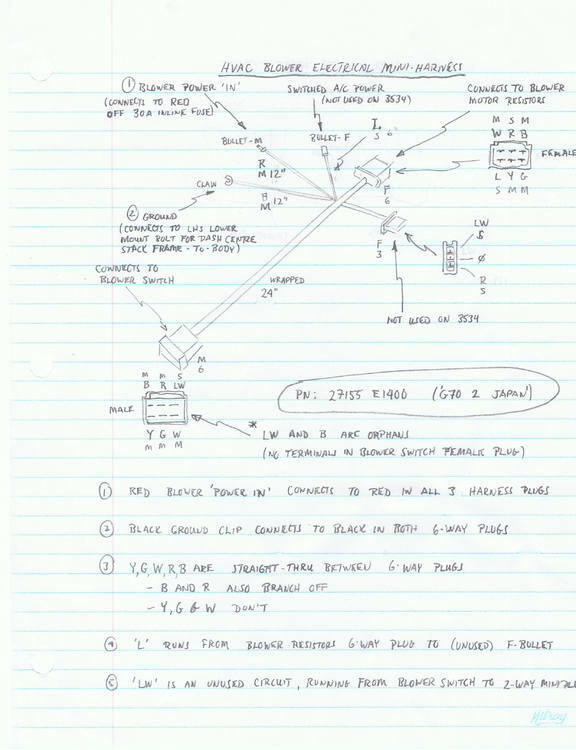 Not sure why, but the early service manuals didn't include the HVAC stuff on the wiring diagrams. From what I can tell, they didn't put the HVAC system on the wiring diagrams until 1974 for the 260. However, I believe I found some reference to the wire in question in a document titled "S30 Supplement Chassis Manual", and that wire is exactly what you thought it is... Power to the blower motor. That's the high side supply, and then the speeds are controlled by grounding the other side of the motor through one of the speed limiting resistors. Glad to help. The documentation got way better as the years went on. Those first couple years were sketchy on some of the sub-systems. By the time they got to 77 (my year), things were pretty good. Interesting to note, however, that even in 77, they used a similar sub-cable for the HVAC system. The colors and positions of the wires are different, but the concept is the same. So if that cut-off blue wire is supposed to provide power to the blower fan, then the other end should plug into a bullet connector on the dash harness. Have you found the other end where it is supposed to connect? I believe it should be blue as well. It's not on the wiring diagrams, but they do mention it in a few of the harness descriptions. The elusive HVAC mini-harness is lurking in the bottom right corner of Fig. 1.2 in the FSM Supplement that CO has posted. It also appears in the bottom right corner of Figure VI-1 at the end of the FSM Supplement, complete with some labeling and a legend with some wire color coding to (sort of) tell you where some of its connections connect to. 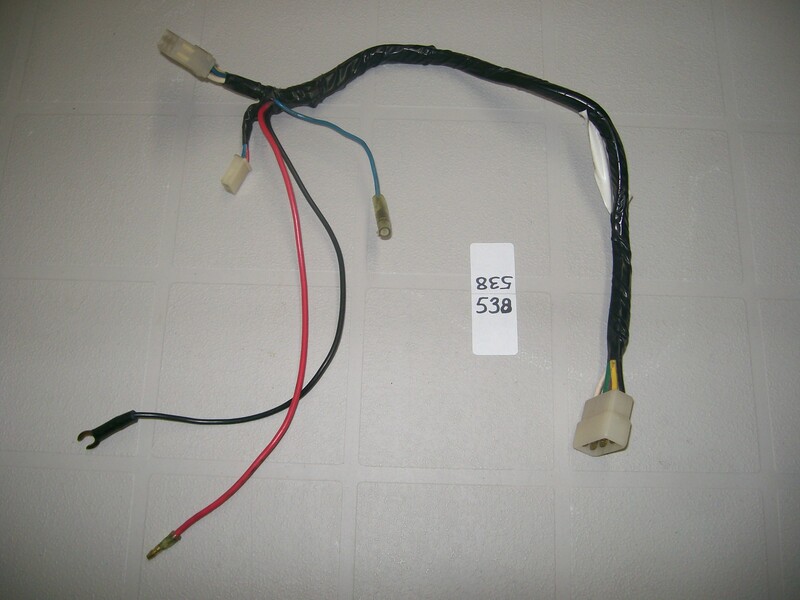 The blue wire is, according to the legend, there to provide a power signal to the A/C system... which was, of course, available only as a dealer-installed option, meaning that for many Z's the blue wire never ended up being connected to anything over the life of the car. When it came from the factory, the blue wire ended in a female 'bullet' connector. Now there's some good documentation for ya!! Way better than what I could turn up! Kudos!! Phil, So the connector in your original pic goes to the speed control switch, right? Not the resistors on the blower housing. If that's the case, then I suspect that B/W is for the A/C system. The end you see in the picture I provided is to the blower fan resistors. At the other end of the harness is a red wire and a blue wire and the connector to the blower switch and the ground. I have the red and blue wires connected together. I will look further into connections to see if the red and blue wires connect to wires other than each other. (Always take pictures before taking apart anything) That's a rule I forgot to follow. I will get back to you all a.s.a.p. Ok, looked closely at namerow drawings and see that i didn't have the red wire attached to the blue fused wire as is stated. Also found one of the 2 wires that connect to the fan motor were disconnected but not pulled apart. Fan motor working great. Thanks namerow and capt. obvious. Glad to hear things are working properly. I think if you did a search on this site, you'd probably find a couple of dozen threads that start with the words, 'Can anybody tell me what this ___ (insert color) wire is for?' It seems that most Z's fell prey to D-I-Y AM/FM/cassette player installers at one time or another, all of whom went looking for a power wire to tap into.